Photo courtesy of the Communications Office. Six and a half years ago, Concordia hoped to elevate its business program while keeping it steeped in the liberal arts. Mark Krejci, who was then vice-president of academic affairs and dean of the college, hired Greg Cant to be the founding dean of the Offutt School of Business. Cant was tasked with responsibilities including rebuilding the business curriculum, creating deeper connections with the business community and helping raise funds amidst a great economic recession. “He delivered on all the roles we set out for him,” said Krejci, who now teaches in the psychology department. Now, Cant has accepted a new position and will be stepping down as dean of the business school. He will be the dean of Montclair State University’s business school in New Jersey. 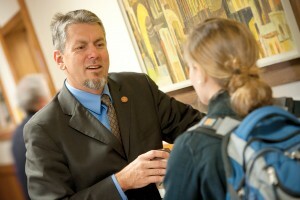 He and his family, including Angela Cant, associate director for Study Away, will be leaving campus by the end of June. Concordia is the only private school Cant has worked for, and he is used to working for big state universities. He is attracted to Montclair for various reasons, including its large size, its proximity to Manhattan and the growth its business school is currently experiencing. “It … happens to be at the cusp of some great opportunity,” Cant said. Cant came to Concordia six and a half years ago to help launch and implement the business school. Back then, Concordia had a Department of Business Administration and Economics, which employed 14 people in a small section of Old Main. Six and a half years later, the once small department has expanded into a $13 million building funded entirely through private donation. Similarly, the faculty and staff have roughly doubled. As founding dean, Cant played a key role in transforming and developing the business program to what it is today. Cant said the curriculum has also improved substantially. For example, new faculty members have brought innovative teaching styles to the classroom,and there are now common business classes between concentrations; regardless of concentrated study, all students gain a wider knowledge about the various elements of business. The business school has also started campus trends. Cant said the Anderson Office of Career Success within the business school has developed strategies that have influenced the college’s Career Center. Other groups on campus have approached the business school to see if they can imitate certain curriculum as well. Teresa Harland, the vice president for advancement, has worked alongside Cant to launch and develop the business school. “(Cant) was not only the visionary for what the Offutt School of Business could be, but he has also had the ability to take what that vision initially looked like (and) … actually put it into play,” Harland said. The Offutt School of Business is at a point that it can continue to build off the success Cant initiated, Harland said, including maximizing the school as a recruitment tool and building upon its brand within the local community and beyond. Krejci said Cant’s job offer from Montclair is a testimony to Cant’s leadership and the Offutt School of Business in general. “I think it’s a major stamp of approval on our business program,” Krejci said.